Enjoy all the beauty and appeal of natural stone, limestone, marble and slate without the practical drawbacks of stone flooring. Karndean's realistic range of stone floor effect and ceramic tile effect flooring is much warmer underfoot and doesn't chip, crack or discolor. 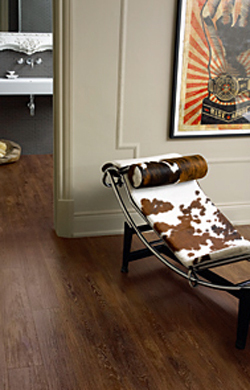 Karndean luxury vinyl plank flooring offers natural wood inspired designs without the practical drawbacks of real wood. Featuring all the intricate details and unique characteristics you’d expect to see in traditional wood flooring, our planks are carefully designed for authenticity. Colours are defined with variable shades and tones, just as they are in natural wood. Karndean has a heritage of hand selecting the raw materials that inspire our products. Designflooring provides you with realistic wood and stone effects but with none of the practical drawbacks of the materials that inspired them. Karndean design flooring replicates the look and feel of natural materials; such as - slate, ceramic, marble, glass, limestone and wood. Made from an exceptionally durable form of customised vinyl, Karndean comes without the drawbacks of some natural products and is much warmer and quieter under foot, offering any home or business an easy and low cost flooring option. As Karndean comes as individual planks and tiles the product offers a significant advantage to designing your own personalised floor. Karndean was established in 1973 with offices in the UK, Australia, New Zealand and the USA. Our dedication to product research and development has earned the company a reputation around the globe for supplying imaginative, innovative and affordable flooring products to both consumers and businesses.